This is one of those webcams of the local affiliate, so it should be neat how it will change. The governors mansion of this liberal crackpot state, where state gov Bill Clinton got his groove on. Fortunately no bedroom was named after the Clinton family. Building where I work, not that this is not the Dillards Tower, it is just where they put the overflow, including my marketing unit. Don't I feel special. Well, I hope you like downtown Little rock. Those are nice. The skyline could use a few more skyscrapers, though. But I guess Nashville has a shortage of skyscrapers when compared to other cities, so it's all relative. I'd actually really like to visit Little Rock. Well, it is a nice city, but it has bad parts. The southwest part of town has really high crime and lots of trailer parks, avoid it when you come, k? Well too bad SimCityEmpire got banned before we got an Arkansas forum going. I wonder what he did. Hmmm...I am pretty sure it listed the name as SimCityEmpire, now it has DHall. The picture from above was not one of the governor's mansion but of the old state house. It sits above the river and at one tme was two-sided to show the importance of the river. This is the Markham Street view. It is on the trolley line and just about four blocks West of the River Market. 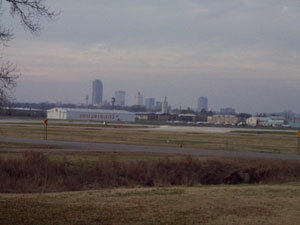 the more i here you guys talk about and post pics of little rock, the more i kinda want to go. yeah... like to see more here too. I have this print framed in my office. It is an awesome view of Little Rock..lots of color and details.